Working out of town all week had me chomping at the bit with this project. I was digging up pictures on the net and making crude drawings in my note book. These were from a guy on Facebook that goes by the name The SA80 Man. A message has been sent his way and hope he can help me with this project. Does anyone else get bored when I’m traveling by plane? I have taken to putting my thoughts down on paper. I was feeling confident and all was well and fine till I got home and hit upon my first major snag. 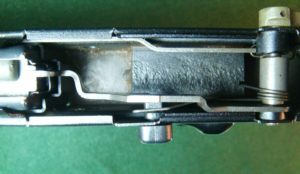 I had to work out the relationships between the magazine, hammer, and barrel exiting the front of the receiver. In order for all those things to line up I realized that the 180B bolt carrier is not going to work. 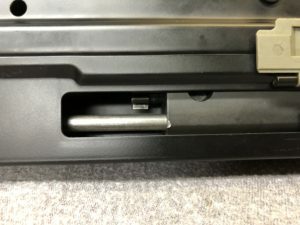 It places the guide rods too low ( The receiver is upside down in the above pic) and they will not allow room for ejection. 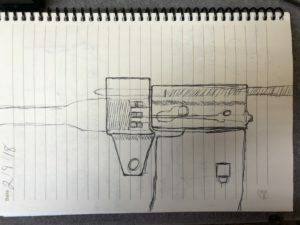 Several thoughts crossed my mind at this stage like cutting out and lowering the ejection port or raising all of the components to work with the existing port. I believe the first is still on the table but the second most definitely is not. The amount of work that would be required is considerable, including raising the barrel. Do that and the hand guards would no longer fit. 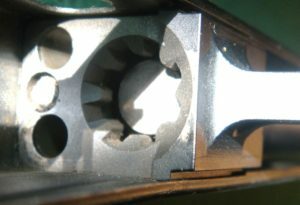 I think the simplest solution is to make a new bolt carrier. The SA80 bolt carrier guide rods are spaced further away from the bolt centerline and as a result, would solve all my problems. 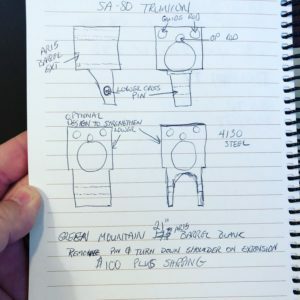 I am not sure how I would go about cutting the cam pin slot. I envision myself drilling a few well placed holes and finishing it off with hours of hand filing and fitting. Oh goody. Nobody said this would be easy. The other option is to find more original parts. Bullpups are getting more popular all the time it seems. I chased a Bushmaster M17S for quite a while before I finally got one. It’s one of my favorite 5.56 guns now. Crappy trigger but a great shooter. Put an old Aimpoint electronic red dot on it. Looking one over might be of help to your project. I will take some pictures of an SA80 bolt carrier and AR-180 bolt carrier for comparison. Since you are building this SA80 knockoff from scratch I suggest you use the trigger mechanism out of a K&M Arms M17S. It’s a bullpup but it doesn’t have a crappy trigger pull. I can send you a drawing of how the linkage works. 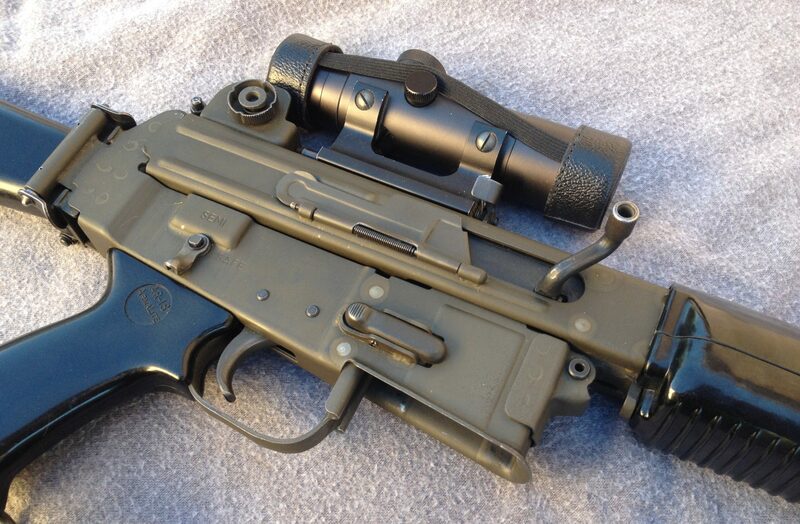 The M17S’s trigger is a modified M16 trigger which was adapted to a bullpup linkage. It uses a proprietary Elftmann trigger. I also suggest you use and M16 barrel for your project with the external threads on the front of the receiver. This eliminates the need for timing your barrel to the action. 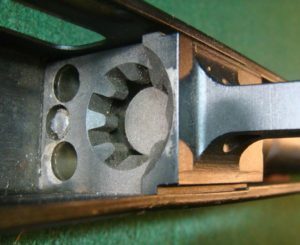 Plus AR15 barrels are readily available for your project.